I’m sure you’ve all heard of the phrases ‘looks can be deceiving’ or ‘don’t judge a book by its cover’, especially from your mum when trying to set you up with that family friend, but it seems to also apply in the restaurant world too. I’ve had my fair share of holes-in-the wall that ended up becoming the go-to place when I have guests, but I mean, how many times have you seen a deliciously cheesy and gooey halal burger on Instagram, only to be sorely disappointed when biting into it? So for that reason, I became a little sceptical about some of the new halal restaurants popping up. However, when a new cool and sleek steakhouse opens up with the promise of using good quality steaks and a Josper Grill to cook their food, wellllllll, you kind of throw all sense aside and rush off to the restaurant, and that is exactly how we ended up at HS&Co last week. 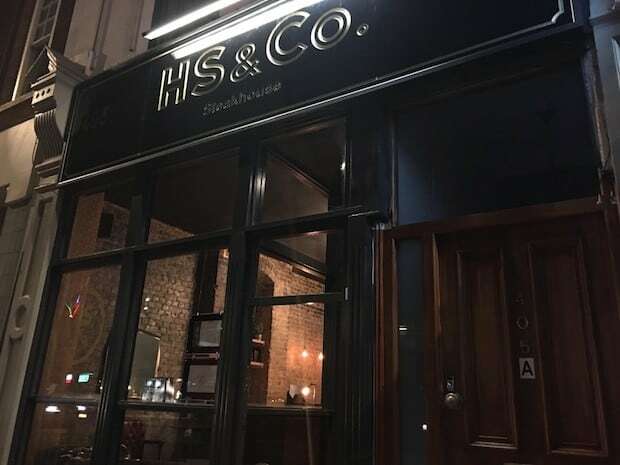 HS&Co is an East-London based steakhouse that has only been open for a few weeks now. Their meat heavy menu boasts of aged steaks, burgers, brisket, and everything yummy you can imagine. The bonus? No alcohol or non-halal products are served on their premises. So, I wasn’t surprised to see the restaurant was packed with large birthday groups, young families, and dates. Luckily, BW and I booked, and snagged a table. The Disney Star Martini was extremely sweet drink topped with half a sour passion fruit and served with a quite random shot of champagne (non-alcoholic, don’t worry!). 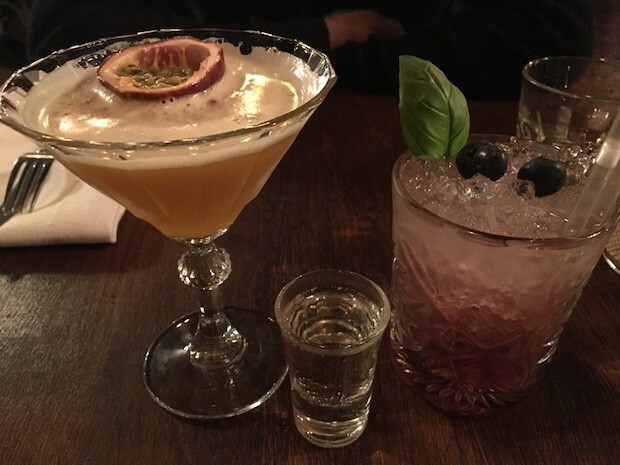 The Blue Basil was an odd combination of blueberry and basil, but it surprisingly worked with a subtle tartness from the blueberries and the aromatic basil to balance the sweetness out. 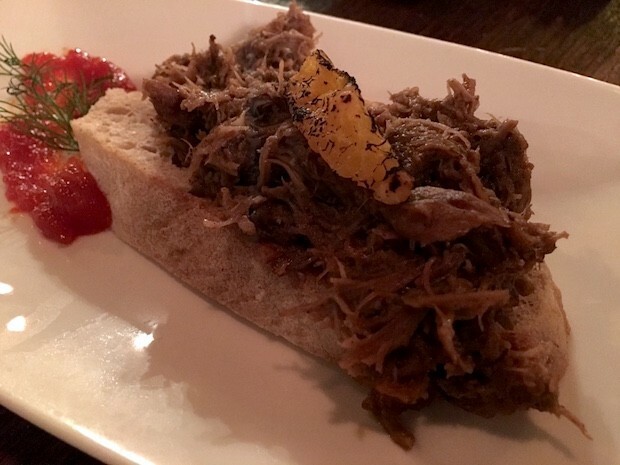 A rustic toast arrived topped with a generous amount of pulled duck with a sweet tomato chutney on the side. The duck was mouth-melting soft, however was a little bland unless paired with the teeny dollop of the tomato chutney they had provided. BW had opted for this without the chicken to make a light and refreshing start to the meal – so healthy, I tell you. A big bowl of salad arrived but, as you can see above, with the smallest amount of dressing possible making the salad dry. 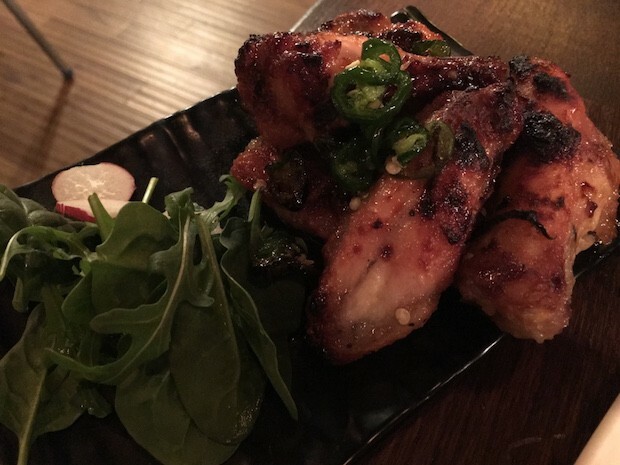 These honey and chilli wings had been cooked really well so that the exterior had a nice, smokiness to them whilst the inside was hot and moist, but the marinade had let them down. The wings need to be stickier and sweeter so that each bite burst with flavour, and could balance out the spiky green chillies. HS&Co have gone down the route of using a Josper Grill to really achieve a great steak and you can see that with the nice charring on the steak. And even though BW asked for the fillet to be cooked to a medium well *rolls eyes*, it was still quite tender. He then proceeded to smother the steak in the tangy bernaise butter which melted spectacularly all over and I jealously watched on. I guess he’s my husband for a reason, because after a minute or two, he offered me the rarest piece of his steak that he could find – aw, true love! A decent bite, but my only concerns would be that the steak was a little watery, and needed more of a salty and peppery crust. An affordable option, but not the best steak in my book. They had also run out of the peppercorn sauce we had originally requested quite early on in the evening. To try out HS&Co’s other offerings, I opted for their cheeseburger and asked for it to be cooked to a medium. Out arrived this little guy and upon cutting in, the thick patty had been cooked to a dull grey and was quite dry. 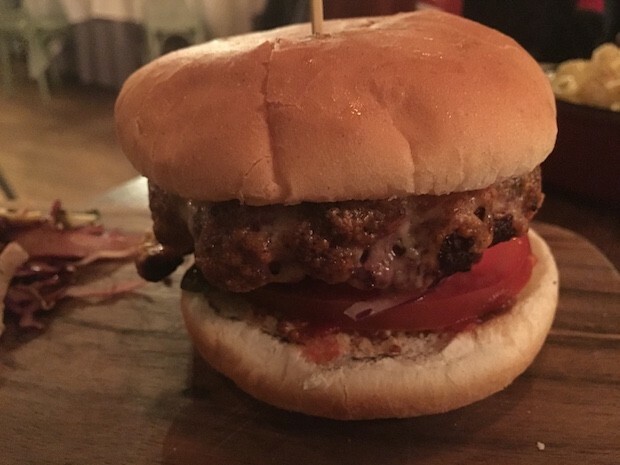 Despite it needing a big kick in flavour, the burger had a good smokiness to it. The cheddar cheese had been melted expertly all over the patty, the condiments were refreshing, and the toasted bun held everything together! Again, not the best burger I’ve had, especially with that hefty price tag attached. 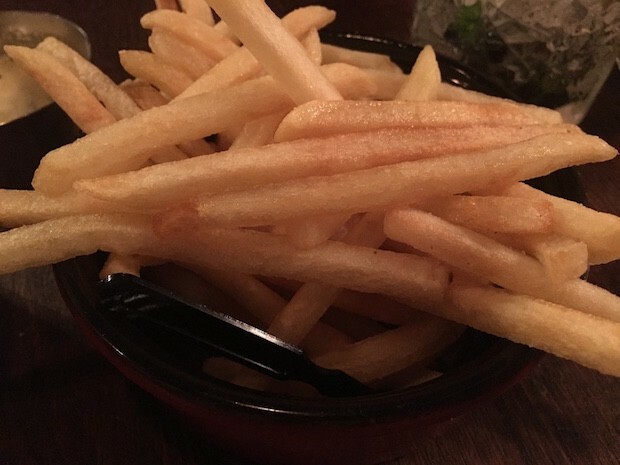 Thin, crispy fries (my favourite type) that had been drizzled in a truffle oil that could have been more pungent. 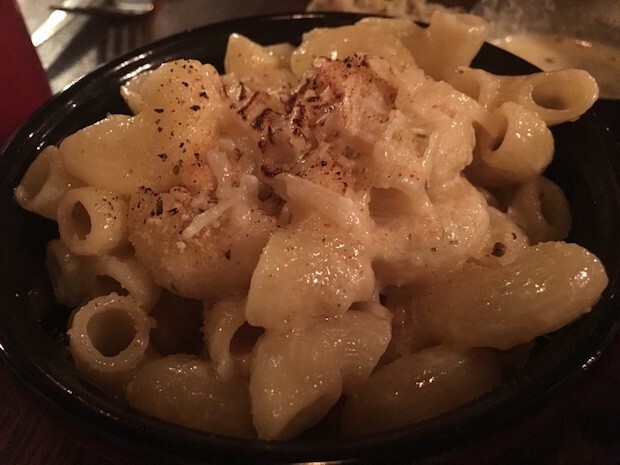 Your usual mac and cheese but needed more cheese to be creamy and gooey. On to the service, the wait staff were amazing, friendly, and patient. However, it was the timing that put a damper on our meal. Seeing as it was just two of us, it was incredulous to find that it had taken an entire 2.5 hours to be seated, served, and billed. BW’s main came out 45 minutes after we finished our starters, and ten minutes later, my burger made a show. Disappointing but the restaurant has only been open for a few weeks, plus there were two large groups, so it is a forgivable mistake for now. 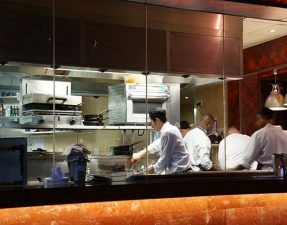 The manager was aware of this problem, profusely apologised, and found a sensible solution in the event that there is a big group next time: set menus. The final bill amounted to £63 for two excluding service, so £31 each. Definitely an affordable option especially when shopping at Stratford Westfield, however if I was looking for a good steak fix, HS&Co would not be at the top of the list. It wasn’t that it was a terrible meal, it was simply underwhelming. Every dish was just average and I kept waiting to be wowed but it didn’t happen. A shame considering the amount of care and effort they have put into the restaurant and menu to make it into a memorable dining experience! Thank you for this post! We visited the very next day, given we live in East London. Went here last night because it’s convenient for after work, we quite liked the steaks we got! The only thing I was really disappointed with was the chocolate cheesecake, which was vanilla cheesecake drizzled in chocolate sauce. Otherwise, quite a decent meal for Stratford and definitely very pretty inside! So, I visited HS&Co yesterday. The service is very slow. The food is average and overpriced for the quality. There are better options so look for some other place if you want to spend this much. Visited here y.day was disappointed with small portions and the ridiculously small plates!!! Fries and mac&cheese towards the end tasted like was eating blocks of salt. Mains came before starter and found hair on chicken!!! But they are new and we was a large group and they were extremely busy so willing to give another go as the staff were nice enough and the steak/other chicken were great. The owners of HS & Co also own the restaurant next door – Dar Marrakech. Have you been there and reviewed it yet? 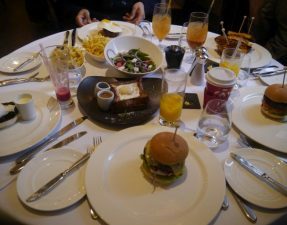 I’ve been to the one on Edgware Road – had such terrible service that I didn’t bother putting a review up. The food was not that great either but I may have gone on a bad day. Maybe some time in the near future, I’ll revisit and review. Have you been to any new burger joints lately? Bad of Burgers I have visited and heard good things about Meatcetera. Would love to see a review of it here. Thank you for the review for sure will be visiting it sometime this week but after seeing the comment my hope are not that high. 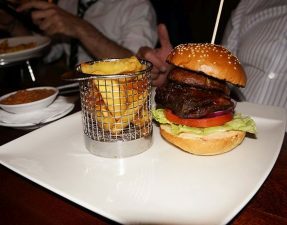 Have you tried The Westbridge Restaurant yet their steak are delicious. You should go there sometime. Visited this restaurant last Saturday evening at 8pm and had to wait for our drinks order to be taken after I stood up and pointed out that we were still waited after 15 minutes. Ordered our meal and waited a further hour then we waited another 10 minutes for our sides. Such a disappointment. We were given a 30% discount but that didn’t make up for the cold steaks and by the time we got them the cold sides. My grandson (aged 8) was with us and nearly fell asleep at the table. He wanted a dessert but was soon told we’d had enough and would buy him one from McDonalds! I arrived with my family to the restaurant this evening…27.08.16. First of all I was greeted after 2 minutes after standing at the front of the restaurant and when I was, I was told I had to have a reservation which it did not state on the website. I was told to wait 25 minutes for a table .., no problem. I was served by a young girl who was clearly inexperienced and got my order wrong! I completed my meal (if that’s what u want to call it) and asked where my garden salad was? Hoping she was not going to say the bits of cabbage was the garden salad! 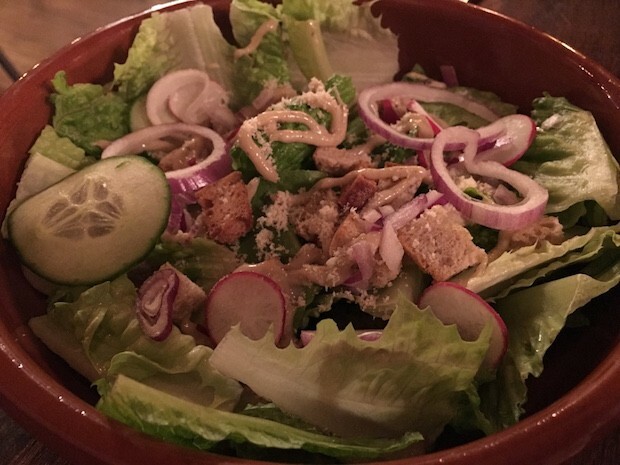 Finally received the salad and it tastes like it had been in the fridge for days. 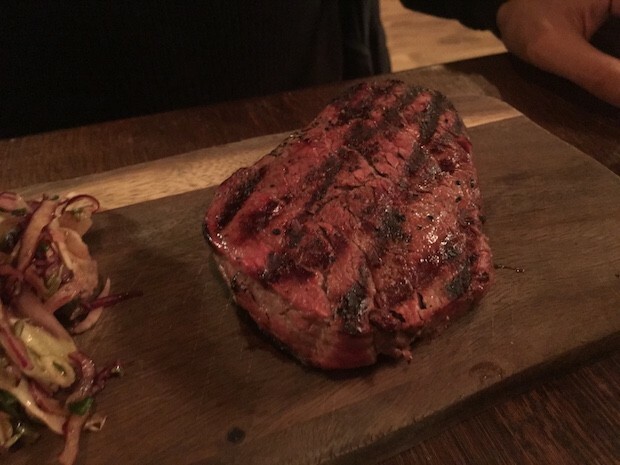 But check this … The steak which I wanted to eat which is why I went to a steakhouse was £40!! Forget that… Rip off!!!! My sis in law would have pulled out a top spread for that money. I don’t mind paying money for decent good but this was not the case. It is a warm summers night for gods sake and there is no air conditioning… For the amount of money you pay to eat in this restaurant you would think they have air conditioning!!! Never will I step into this restaurant again… Don’t know why it is highly recommended or what the hype is about?! If I want to spend this money I will eat in Kensington , Chelsea or Knightsbridge.